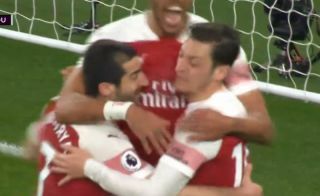 Arsenal made it 2-0 against Bournemouth this evening thanks to a well-crafted Henrikh Mkhitaryan goal, with video below. And once again Mesut Ozil has been involved for the Gunners, unselfishly setting the Armenian star up for an easy finish from close range. While Bournemouth’s defending was far from impressive, Arsenal did well to make the chance count, with the quality and vision of Ozil showing itself to be a real asset.